My first race back after a long injury, and what better race to come back to than the spot of my first Half Marathon, just one year ago. Last year on this day I lined up to run my first Half Marathon, the Run the Reagan Half Marathon, but today I lined up on that same road to run what in many estimations was my second first race. After a long 8 months with a broken collar bone, today marks my first race back. I was looking forward to this day, but in many ways was also kinda apprehensive and worried. The fact that my last 5k I ran was the one that I was tripped in made lining up for this race somewhat worrisome. The day started out great at 6:30. That is one of the beauties of a local race (the starting line was about a 5 minute drive from my house) There was 60% chance of rain with 50 degree weather. It had rained much of the night so I was hoping most of it was past. This race also marked another first, it was the first one I volunteered at. Since I was not yet ready to run the 10k, or the Half Marathon, both of which were running first, I decided I could help with the race. Our church supplied all the volunteers for the post race refreshment so I signed up to help. I was a bit down when I went by to talk to many of my friends that were running the half marathon and 10k, I really wish I was further on in my training. The half marathon, and then the 10k took off and I did my duty of helping set up the food and water. 9:00 came and so did my wife and kids. We had it planned that our middle daughter, Payton (13), and our son, Brady (7), were going to run the 1 mile fun run, and I had planned on running it with them. We lined up just before 9:30 and everyone was excited to get this race going. It was a little chilly and it had started sprinkling a bit. I was very proud of both of them for doing such a great job. I was especially proud of Brady Who ran the entire race without stopping. A little bit of a criticism for the race organizers - the 1 mile run was only .8 of a mile. I was a bit surprised at the time when we were coming up on the finish line and so I looked down at my MyTach and it clearly stated we were only at .8 of a mile. 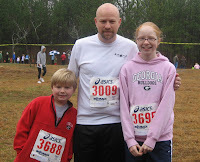 Even so, it was a very enjoyable race, and I was very proud of both of my kids. Payton finished before Brady and I, we came across the line in 8:18. 10:00 was now just around the corner and everyone was lining up for the 5k. It was a hugh crowd that had come out to run this race. I weaved my way to the front of the line to ask a question, then backed myself into the crowd a bit to take my position. As can be understood, I was a bit nervous and was paying a lot of attention to those around me.... especially those behind me. I DID NOT want another broken collar bone. 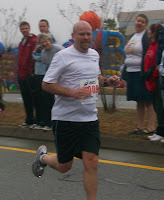 The race took off just like many other races that I have run. I took off easy and tried quickly to get into a comfortable pace, but right at the front of my perceived ability, all the while carefully watching those around me to make sure nobody was getting too close. The first mile, then the second mile, and then the third..... wait, was that third mile actually a mile? Nope, not again race organizers.... you cannot tell me that is the mile 3 marker when we still have that far to go to the finish line. I once again checked my MyTach, and sure enough, we were only 2.8 miles in. I finished off the rest of the race to my family cheering, as well as many familiar faces along the sidelines cheering me on as I was heading for the finish line. One of the coolest things was then going through the food and water tent to all the cheers from my friends from church. Oh, and guess what? I was hoping for a time somewhere around 28 minutes for my first race back....... I finished in 26:26! Just 3 minutes slower than my 5k PR set back 9 months ago! I finished off the morning by changing back into my volunteer shirt and getting back to work. What a very enjoyable and memorable first race back. Way to go Tim! That's an awesome 5k time. HOW FUN! Great post, Tim! Congrats to you on finishing your first 5K of the year. What a comeback! Your kids did a fantastic job too! It's so great to hear that you're racing again. That's a big accomplishment in & of itself. Don't worry; with your determination, you'll be well on your way to racing in the Reagan Half by next year. Sounds like you all had a fantastic time! Great photos too! Congratulations on your first race back! You did great! Congratulations Tim. Great race and a great comeback time. With all the GPS technology now there's no excuse for race organisers to get distances so wrong. Just seems weird that they, more than you would expect DO! Congrats Tim. It must feel good to be back in the saddle again! congratulations! It must feel incredible to overcome an injury and start running in races again! 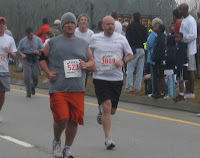 My myrtle beach marathon started Sat. @ 6:30, too... so we were both running sat. at 6:30! Great job! Fast, too! Looks like you'll be running fast 10Ks and Half-marathons soon! Great family time! Even the youbgster did a fast .8! Thanks all for stopping by and for the very kind comments. I just recently updated the post with the official results from the race. I did better than I expected with the standings. Good job. Long comeback! I remember when you broke the collarbone and how bad it was for you. Great job coming back from that and staying motivated. Great comeback race. Great picture of you and kids. Nice to see you racing and building miles again, Tim. Congratulations. Thanks Rick! I have seen you are back at it as well. Godd job!